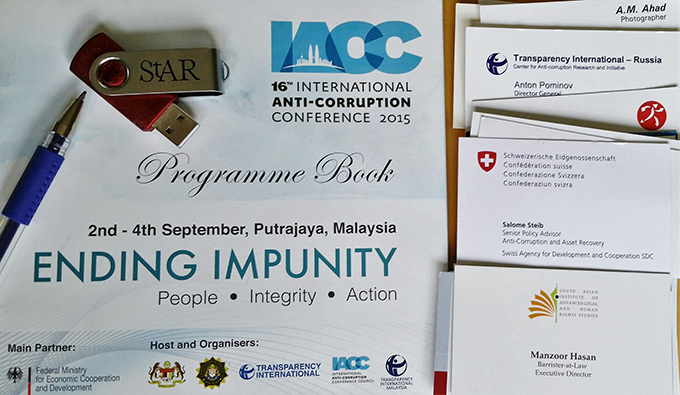 The IACC culminated in the Putrajaya Declaration and Statement by Friends of the IACC, both of which firmly placed the recovery of stolen assets at the top of the international anti-corruption agenda. It directly addressed the issue of beneficial ownership, calling on G20 countries to take the lead in contending with secret companies that are used to hide corrupt assets. Six countries – Germany, Norway, Republic of Korea, Switzerland, United Kingdom and the United States – demonstrated leadership by issuing a statement in the name of the ‘Friends of the IACC’, reaffirming their commitment “to recovery and return of confiscated proceeds of corruption in a transparent and accountable manner ensuring that assets are disposed of to the direct benefit of the citizens of the state harmed by corruption” (as required under the UN Convention against Corruption - UNCAC). StAR welcomes these statements, particularly as they come at a pivotal time in stolen asset recovery. Next year, the States Parties to the UNCAC will look at whether countries “have afforded one another the widest cooperation” to make recovery possible. In November of last year, the G20 issued its High Level Principles on Beneficial Ownership Transparency and stated that its member countries are committed to leading on this issue that is integral to fighting corruption; those present at the IACC are now waiting to see whether and how the G20 countries make good on their commitment. The Financial Action Task Force, the international standard setting body on anti-money laundering and countering the financing of terrorism (AML/CTF), has also recently begun to evaluate the effectiveness of countries’ implementation of global standards. The international anti-corruption community has made it abundantly clear that all three can and must serve as powerful tools for achieving greater recovery of stolen assets. The relatively paltry sum of $147 million in assets returned from a small number of OECD countries during 2010-2012 gives us pause, showing how much work needs to be done to recover stolen assets. However, once seemingly unsurmountable legal and practical challenges and barriers to asset recovery fade away when countries muster the necessary political will to see these cases through. Examples include the recent return by Liechtenstein to Nigeria of US$225 million in Abacha stolen assets, the asset freezes and money laundering investigations being undertaken by the Swiss authorities, and victories by the US Department of Justice’s Anti-Kleptocracy Initiative in the cases against stolen assets of Chun Doo Hwan and Teodoro Obiang and others. For the countries still standing on the sidelines, history will be their judge, but StAR stands ready to assist on all levels (through advocacy, knowledge creation and dissemination and operational support) so that they can engage in this crucial area for development. Ji Won Park is an attorney and consultant at the Stolen Asset Recovery Initiative (StAR) and the Financial Markets Integrity unit of the World Bank.